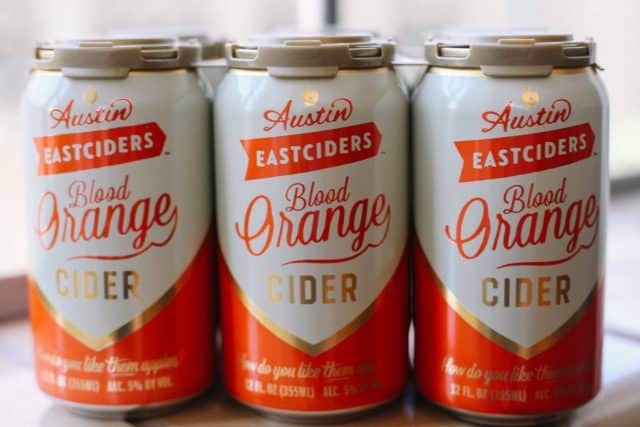 Austin Eastciders is excited to announce the release of its new Austin Eastciders Blood Orange Cider, available April 3. The easy-drinking 5% ABV Blood Orange Cider is available in individual, 6-pack and 12-pack 12-oz. cans in bars, restaurants and other retailers (including Costco, HEB and Whole Foods) throughout Texas, New York City, Philadelphia, Baltimore and Virginia. Blood Orange is a zesty, dry cider crafted with bright red Sicilian blood oranges, heirloom bittersweet apples and American dessert apples. The Sicilian blood orange has a distinct, sweet flavor with light flavors of raspberry and grapefruit, which results in the cider being medium bodied and crisp with a hint of tangy citrus. The mouth-watering blood orange flavor is slightly more pronounced than a standard orange, but not so intense as to overwhelm the apple-forward flavor profile. The tangy citrus adds a unique complexity to the effervescent cider and will delight cider drinkers, beer fans and wine enthusiasts alike. Notes of ripe apples and orange zest make you want to dive into this cider, which is ultra-refreshing and reminiscent of drinking mimosas on a Sunday afternoon. “Our team crafted well over a dozen different ciders before deciding on Blood Orange for our spring 2017 release. We then perfected it with Sicilian Blood Oranges using both the juice and a bit of the rind to land this apple-forward, very refreshing, crisp and citrusy cider. Given the exuberant reaction from our tasting panel, we expect our Blood Orange to become an instant favorite. Try one and you’re not done,” said Austin Eastciders CEO Johnny Heiselberg. In addition to Blood Orange coming to market, Austin Eastciders is proud to also launch its first 12-packs of 12-oz. can variety packs, which include three cans each of the company’s Original, Hopped, Texas Honey and Pineapple ciders. Variety packs are on sale now in all Austin Eastciders markets. For more information on Austin Eastciders, visit austineastciders.com.